Anthony Watts has written two articles about Hurricane Harvey so far. I use the word "written" very loosely. It doesn't mean he authored much original content himself. His first article (archived here) has the headline: "Hurricane Harvey: likely to be the next “Katrina” and “Sandy” for climate alarmists". It comprises copies and pastes of information from weather agencies though, as usual, Anthony neither credits these agencies nor provides links to the originals. It's not until you get to the tail end of his copy and paste bonanza that you find any original content. That's where you find out what Anthony thinks about Hurricane Harvey and the dire predictions. He doesn't want any speculation about the impact on Harvey of climate change yet that part of his article is all about climate change. The average temperature for most of the Gulf was 86 degrees, said Kevin Trenberth, a climate scientist with the National Center for Atmospheric Research in Boulder, Colorado. ...Since the 1980s when high-quality satellite observations became available, scientists have seen an increase in the “intensity, frequency, and duration” of Atlantic hurricanes, along with the number of Category 4 and 5 storms, according to the 2014 National Climate Assessment. The reason warmer oceans fuel stronger hurricanes is pretty easy to understand, University of Texas climate scientist Kerry Cook said. Scientists even have figured out how much more evaporation to expect. For every nearly 2 degrees of average sea surface temperature warming, evaporation increases 7 percent, Cook said. The concept relies on a well-known physics principle called the Clausius-Clapeyron relation, she said. Unlike the reckless people on denier blogs, mainstream media is more concerned with reporting what's happening now, at the beginning of the unfolding disaster. Responsible journalists are not trying to play games with the people of Texas. They are more concerned about reporting what is happening so that people will act on facts. Disinformers are more concerned about point-scoring than they are about the lives and well-being of the people affected by the hurricane, rain, storm surge and floods. In Anthony's second article he was making out that the USA is all that matters for global climate. His headline was "It’s over – 4324 day major hurricane drought ends as Harvey makes landfall at Cat 4". To put this in perspective it pays to consider a couple of things. ...Just last month, the rain from Hurricane Matthew flooded around 100,000 structures in North Carolina, and damage is expected to be in the billions of dollars. 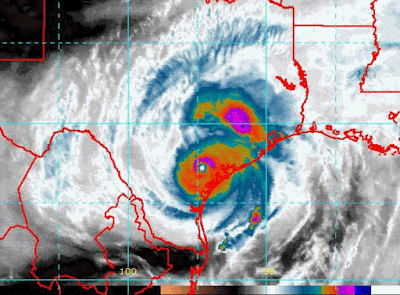 This storm was “just” a Category 1 at landfall and thus not a major storm. There's more. The Heartland Institute pulled together a rabble of climate disinformers and offered their lies to the media (archived here). I cannot imagine any responsible journos taking them up on their offer. Hurricanes, like the other mechanisms, cannot usefully be modeled, even with the largest and most sophisticated climate models used by the U.N. Intergovernmental Panel on Climate Change. Heartland offered a list of people they termed "Heartland Institute Experts", which only goes to show that the Heartland Institute has no access to experts. Not only that, but they lied about some of the qualifications of their so-called "experts". The press release referred to John Coleman as a "meteorologist". He's not. He's a journalist and business person. It referred to Timothy Ball as a "Former Climatology Professor". He's not. He's a former geography professor (teaching mainly, not research) and a current nutcase of a conspiracy theorist. Many of the other fake experts offered up had no qualification other than being a "policy advisor" to The Heartland Institute. A couple were listed as economists. Tom Harris, who gets his climate "expertise" from the bible and claims that climate science is a hoax, was included in the list as well. The GPM satellite measured rainfall in Hurricane Harvey on Aug. 25, at 7:50 a.m. CDT (1150 UTC) and found that intense storms in the eastern side were dropping rain at a rate greater than 3.2 inches (82 mm) per hour. Now the dismal WUWT-ers believe Anthony's predictions have already happened. They are, as you know, a pack of utter nutters. No reputable report that I've read has stated or even hinted that Hurricane Harvey was caused by global warming. It's affected by global warming for sure, but caused by it? That's not the way to look at a weather event. There would be no way to tell as far as I know. One might as well claim that a recent sunshower was caused by global warming, or a cloud in the sky (or a cloudless sky) was caused by global warming. ptolemy2 thinks Harvey is much ado about nothing. At a guess, he's a he and he doesn't live anywhere near the Texas Gulf Coast. The dystopians are getting desperate for bad news. I thought that only category 5 was noteworthy. Now category 3 is already being hyped. It’ll fizzle, then they will make the most of some wet ground and cardboard boxes bouncing along the street, with hair flapping melodramatically. Maybe some drowned earthworms will underline that we need to act now! I think that they may be hyping the sustained wind speed as they usually do. It will be interesting to see what the actual ground based measurements are. NuSchool Earth showing about 125kph, not 175Kph. I wonder if the quote is for top of the Hurricane satellite measurements. Dubya Gee mistakes the name of a website with the category given to Harvey. Is it the first time he's visited Category 6 at Wunderground.com? nicholas tesdorf couldn't lie straight in bed. Australia's ABC did not market this as the largest ever. Twelve years is not "ever". The craziest part of all this craziness is that some are even able to doubt Harvey was at least a category 3 hurricane. And this despite buoy data, ground data, videos data of towns pounding by heavy rains and strong winds (some buildings even at least partially collapsed in Rockport, Texas, due to the wind...). And despite the data from the Hurrricane Hunters. It is likely that many WUWTers are patriots and pro army; but not when it comes to the heroic job of the 53rd Weather Reconnaissance Squadron. Prouving that Harvey is a category 4 hurricane is not patriotism I suppose... It is almost beyond me how a human being can be hold so many conflicting opinions; and especially how they can despise in the same time that they praise the job of the USAF. Many of them have a greater loyalty to the fossil fuel industry. Others - similar to Donald Trump - are only patriotic when this does not involve them doing anything, well, patriotic. Speaking of conflicting opinions held by Wutters:. Wutter 1: The intensity of hurricane Harvey isn't down to climate change, it's down to bad luck. 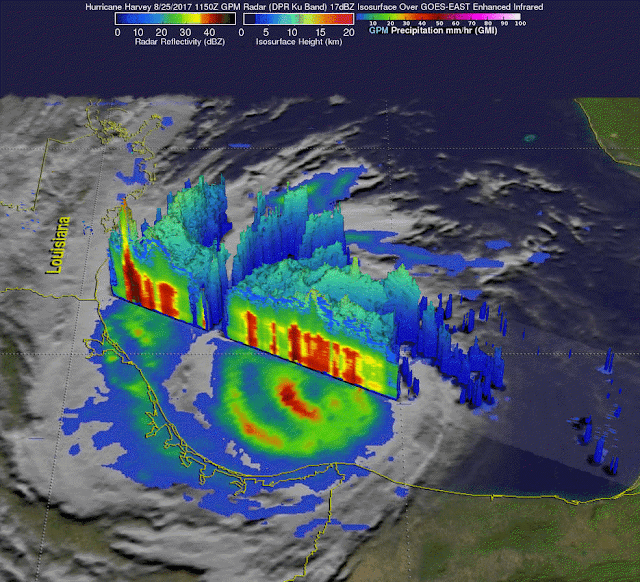 Wutter 2: The 12 year drought in land-falling cat 3+ hurricanes in the US is proof positive that climate change is crock. It had nothing to do with good luck. Both beliefs could also be simultaneously held by a single Wutter without their having any awareness of the inconsistency or irony. Minimizing hurricanes is something you'll see a lot among deniers - after all, it cannot be worse than in the past AND you can then promote the conspiracy that official organisations are being deceptive. Marohasy did the same in Australia quite some years ago, where she used data from one weather station on the side of a cyclone to announce the Ossie Met Office was being alarmist in classifying a cyclone as Cat 5. That accusation was then spread fast among the usual suspects, including media suspects. Exactly. I see that one of Jennifer's partners in crime has written a stupid article for WUWT just now. That's now about the highest fame deniers can hope for any more. They have to take what they can get, I suppose. Arpaio is a genuine American hero. Nobody who supports Trump will be against the decision. Law and order (meaning zero civilian oversight of police, especially not when it hurts brown people) is what they're about. Sou, as numerobis says. There will be few deniers who do *not* support this pardon. They don't see Arpaio as a sich sadistic racist, but as the zero-tolerance anti-latino immigration guy who went against Obama, and then was falsely prosecuted in a political witch hunt by that same Obama. In the US identity politics trumps facts, especially for those who are in the deniosphere already. Sydney Morning Herald reports Harvey has been downgraded to a tropical storm. Phew,that must be OK then. I thought there wsd something to worry about there. How silly of me. The fact it is probably going to hang around and dump huge amounts of water will not be a great concern? That is what happens to storms. They all die and go from high to low categories as they do so. Hurricanes do not go on for ever? Phew, I was worried that hurricane immortality meant the entire planet must one day be covered with hurricanes. Hey Errol, how's that automatic gainsay business going? Must be a hard row to hoe these days. Since all tropical cyclones lose strength when they hit land (thus Victor Venema's "triple face palm"), no tropical storm can be dangerous! Or the current one can't be more dangerous than all those previous storms that loss power when hitting land? Of course, bullets fired from a gun decelerate when they hit the human body, which is why no one can be killed by a gun, eh, Eric? Sou - a minor correction. Your first image is IR - channel 4 - so it is showing cloud top infrared emissivity (cloud top temperatures) not water vapour. Don't be surprised if Harvey pops out over water again in a day or two and we have some level of re-intenisfication (though most likely not to the scale that Harvey originally was). Most tropical cyclone experts get very cautious when asked about climate change and tropical cyclone intensity. There are many competing factors that interact to provide an upper bound on intensity (SST, oceanic heat content through depth, the depth of the thermocline itself, atmospheric moisture, wind shear, upper level divergence etc). My guess, for what it is worth as it is only a guess, is that there will be a percentage decrease in the number of events, but an percentage increase in intensity. What those percentages are - I don't know. However, if people choose to say that there has been a drought in very intense tropical cyclone, I'd refer them to the 2015 season in the Pacific (which was a doozy). Good catch, George. I originally had the water vapour image then changed it for the IR image. I neglected to change the text. My bad. Fixed now by reverting to the original image (to keep to the point). I'm finding it difficult to comment on the horrors of Harvey, since it strongly reminds me of Katrina and Sandy and is going to get much much much worse. Very different storm, but same optics, a slowly unfolding public catastrophe of unimaginable dimensions. People downplaying it or trying to imply that extremes are not getting more extreme scare me, as they provide excuses for people to look away. Authorities now asking for volunteers with watercraft to help with rescues. CAGW is just a NWO political agenda for one world government. Houston apparently has become a hotbed for severe rain and flooding due to being near the Gulf where Tropical Storms/Hurricanes linger this time of year, being flat and near sea level with waterways going in every direction making it vulnerable to storm surges, heavy rain and flooding. Increase urbanisation increases flash flooding also more impermeable surfaces, under capacity drains and culverts, debris and roots, and concentrated flows. More here and here and this and lots more. The title of this blog is "Hurricane Harvey through the eyes of science deniers", so thank you for your illustrative input. Illuminating. Or do I mean Illuminati? I blame the idiots who moved Houston near the Gulf. They should have left it where it was. Trump struck down Obama’s flood risk regulations two weeks before Harvey. It was cat 4 at landfall and typical damage of winds that category can be seen in Rockport (which has been rendered uninhabitable). This is not even interesting. The deluge, from which Houston will not recover (5/6 of people uninsured) is the thing. Harvey of course is a full symptom of climate detonation, both by it's RI and raw precip numbers. With all those revionists around the US needs to lose another couple of cities. No worries, just wait. The record rain in Houston was a tad over 8 inches. Two days ago they smashed that record by more than six inches -- 14.4". Yesterday they smashed the new record by an inch and a half -- just over 16", a fo I'm curious how the mayor's decision not to order evacuations will go down in history. "they would have either laughed at us or ignored it"
This is true for warnings of global warming, too ! Agree. There will be lots of soul-searching and blame allocating in the weeks and months ahead. At least no blame can be assigned to the forecasters. I was skeptical of some forecasts, but the worst of them that I saw are eventuating. This thread was interesting. It's about how roads are designed for floods - not necessarily of this magnitude. Yes. I'm guessing you're talking about increasing the temperature scale across Australia. It applies to lots of other measures, too, doesn't it. I've also been waiting for the dam release, which happened in the Queensland floods. It's now happening in Houston, too. While climate alarmists on this blog and elected officials blather about “zero-carbon” footprints, nothing is done to prepare for weather events that have happened before and can always happen again. Will present this at the AGU meeting this fall should the submission get accepted. Houston is bad, but Bangladesh is 1/3 under water. We need to understand climate cycles such as ENSO and IOD. Oh what a surprise: Bojangles is anti anything that impacts on fossil fuel industry profits. Bojie: Actually nothing like this HAS happened before in US history. But don't let facts get in your way. Bojangles is just looking for a fight. In other words, trolling. She or he calls for adaptation to extreme weather, but with no mitigation of the cause of it getting worst. And she falsely insinuates that HotWhopper is against taking steps to adapt to the changing climate. That's not so. We will need to continue to spend money and expertise to adapt, and for rescue and recovery from events, as well as taking steps to minimise the risks. Remember, Donald Trump, the US President is against prevention *and* against adaptation. Just a few days before Harvey he tossed out existing requirements to ensure federal buildings are built to withstand floods. Yes, Bojangles, Harvey was a hurricane, they have been known to make landfall, and extreme rains have happened before...but Houston has spent money on flood mitigation from those experiences, and that infrastructure worked really well to a point. Another problem is that Houston allowed building in flood zones, even inside those magnificent retention basins that did so well...so infrastructure has to be supported by political will, not undermined by expedience. And now they need to meet higher standards, and/or 'fall back' in abandoning some areas to meet 1:1000. Spending money on solar and wind power is part of the mitigation and adaption package, so your framing is nonsense. Exiting fossil fuels and upgrading infrastructure is not a choosing matter. It's interesting to live in a time when the party in power in the biggest economy in the world literally has a quixotic obsession. As the standing waters in the area look grimmer by the day, one is reminded that the toxic situation will linger for years to come, and those least able to protect themselves from it will suffer the most. On the bright side, victim blaming has taken a back seat and people are rediscovering the goodness of sharing and helping. But do spare a moment for the massive deaths in Mumbai and other sufferers around the world. Meanwhile, we anticipate Irma next week: a more conventional storm, but a huge wallop of dread on the way. Bojangles: Is it kind? Is it true? Is it necessary?